This salty frog has been sailing the seven seas for ages. Kapp’n appears at the jetty on the beach in Animal Crossing: New Leaf, but not until after Tortimer pays the mayor a special visit. 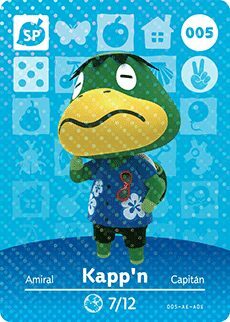 Handing Kapp’n a paltry 1000 Bells will see him ferry you to a remote tropical island where Tortimer now resides. His birthday falls on July 12th, meaning that her star sign is Cancer.